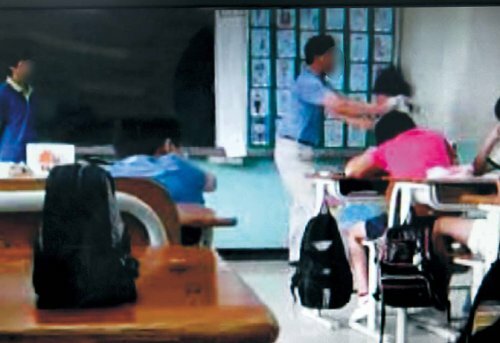 The ban on corporal punishment in schools has emerged as a controversial issue between the liberal Seoul education superintendent and the Education Ministry. The Seoul Metropolitan Office of Education on Monday imposed a full ban on all forms of corporal punishment in schools, a policy which the new liberal head Kwak No-hyun vowed to implement during his election campaigns. The decision also followed a recent scandal in which several elementary school teachers used excessive violence on their students under the pretext of disciplinary actions. Corporal punishment, though principally banned under the present education law, is allowed under limited circumstances and most of the schools therefore stipulate the method, level or prerequisites of corporal punishment in their internal regulations. Even when not clearly manifested, physical punishment on a minor level is generally accepted in Korean schools. The Education Office’s new ordinance, however, bans all forms of physical control over students, regardless of the reason or situations. Teachers who practice physical force upon the students are to face inspection and disciplinary actions. The Education Ministry, together with the conservative Korean Federation of Teachers’ Association, condemned the Education Office’s measures as arbitrary and irrelevant. “The Education Office should have brought the issue to the open forum before handing down its decision,” said a ministry official. The KFTA also criticized the new ordinance as a non-democratic decision of the Education Office. “The decision does not reflect the needs of the teachers and parents in the education circles,” said a KFTA official. The Supreme Court, or the Constitutional Court, also ruled in the past that corporal punishment is legal as long as it is in proportion to the student’s wrongdoing and is socially relevant, said officials. “Random violence, whether by peers or by teachers, should be abolished, but a hasty ban, without any alternative educational solutions, is not the answer to our pending educational problems,” said the official. In a national survey conducted on 442 school teachers last December, 79.4 percent of the respondents answered that adequate corporal punishment is necessary in Korean schools for the sake of proper education.